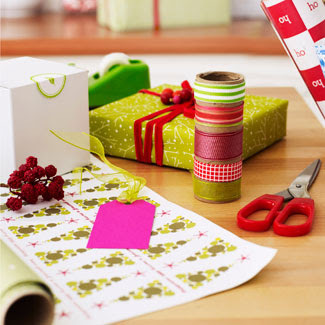 Craft room or gift wrap station is a place to create wonderful gifts for the Holidays. Here's how to organize your tools so that gift wrapping is fast and simple. Keep your most popular gift wrap ready to go at all times using a paper dispenser. Store bows, ribbon, and name tags in a handy tiered wire fruit rack. 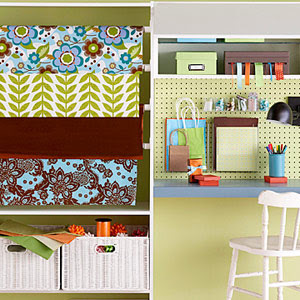 One cabinet in a home office can hide crafts supplies but keep them within reach. These pullout drawers are perfect for holding wrapping paper, ribbon, and tins of other supplies. 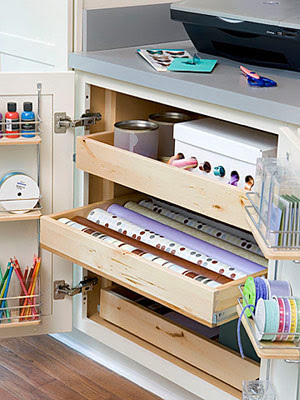 Use the inside door space too, perfect for housing paint jars, vases filled with color pencils, and more ribbon. The counter holds a copier for enlarging patterns. 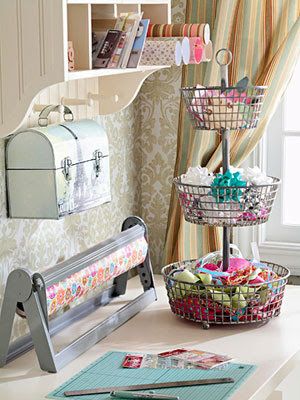 This fabulous wrapping station is a great addition to any crafts room. 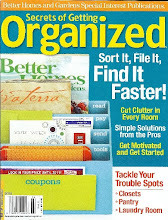 Made for closet organization, simple cabinets such as these are great for other uses as well. Pegboard added to the wall lets you hang hooks and containers to store embellishments and other small gift wrap and crafts supplies. 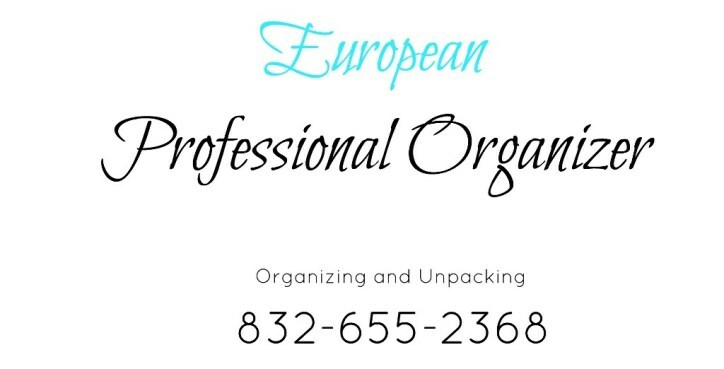 Ribbon boxes are available in many sizes and keep ribbon in check. Add a work lamp and you're ready to wrap! Designate a table, then clear off the surface, so you have ample room to spread out and a seat on which to perch. Use tools that help you work efficiently, like a weighted tape dispenser for grabbing pieces of tape one-handed and sharp scissors. 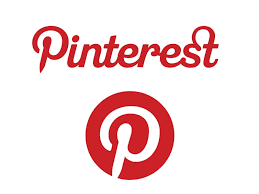 Forget the frustration of tangled ribbon. 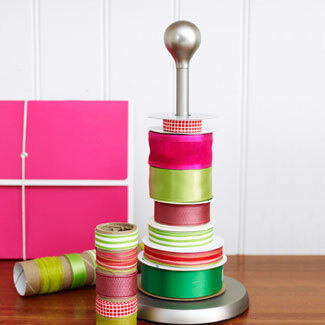 Stack spools onto a paper-towel holder for easy access, and save leftover pieces of ribbon (that no longer have a spool) on empty paper-towel rolls, using a piece of tape to keep each wrapped tight. Stash the rolls in a handy box, so you know where to find them next year or whenever a wrapping project arises. Sending You and Yours Holiday Greetings and Best Wishes for a Happy New Year 2011 !